Much ado has been made about how bad Constantine was for the church, but newer scholarship is beginning to show how good the church was for the Roman empire. It was once common to see Constantine’s conversion as an act, a power-play to grab support from a once marginalized sect. Thus his subsequent lavishing of power and wealth on the church and its leaders was an ostensible attempt to solidify his power. But more sober scholarship is showing such depictions to be little more than highly anachronistic caricatures. Constantine lived well over a millennium before Machiavelli. Roman emperors took divine support as a given. The gods were just something a person did not mess around with. Constantine’s conversion, though imperfect and certainly gradual, was honest. As for Constantine’s subsequent support of the church, Hal Drake has made a quite convincing case that Constantine was trying to marginalize what he considered “extremist” Christians (like Arius and Athanasius) in favor of a tolerant and broadly inclusive Christianity. Constantine did not quite achieve his goals, but his policies resulted in a rather more just empire than the one that he inherited. Constantine and Licinius passed the Edict of Milan in 313. Every so often I still read that this edict made Christianity the official religion of the empire. Hardly! The edict did not single Christians out. It made very general references to a supreme deity, and it stated that from now on any person could worship in whichever way he or she wanted, so that whatever deity was in charge of things would bless the empire as a whole. Something like “separation of church and state” would have been unthinkable for people back then. Deity was simply real, as real for them as electricity is for us today. But what makes this edict remarkable is that it does guarantee freedom of religion, albeit with the provision that those religions bring God’s blessings upon the empire. 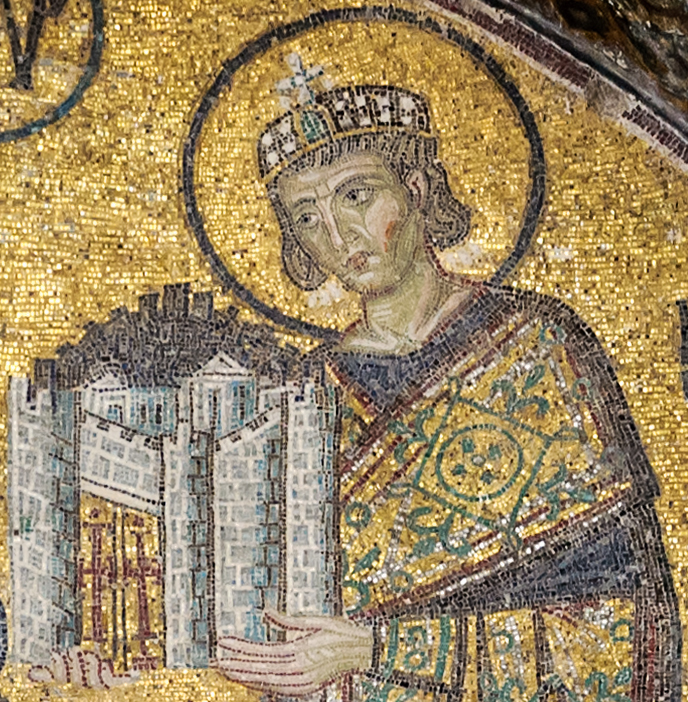 Constantine was less the despot than his predecessors. This owed in large part to the way he attempted to organize Christianity as a tolerant umbrella monotheism that could help to put an end to religious strife and unify the empire around a common set of values. Past emperors always had to work with certain constituencies, namely the rich and the powerful. Constantine had a new constituency to satisfy, namely the church, represented by the bishops (who at the time were basically local church pastors). Theologians tend to focus on the doctrinal controversies they dragged him into, but the bishops had practical concerns as well, namely care for the poor and disenfranchised. Were some bishops corrupt? To be certain! But the majority were genuinely more concerned for the souls and the souls of their flocks than they were with money and power. The bishops’ constituencies, the common people, became the concerns of the emperor as well. We have to remember that Constantine believed his reign would be successful if he had favor from God, and the way he had favor from God would be to care about the things God cared about, namely the poor, orphans, and widows. God cared about those who had no power, and so if Constantine wanted to keep his power secure, he had to care for those as well. Tax revenues were lavished upon the church, but percentages of those funds were earmarked for support of the poor. In addition, one of Constantine’s most notorious laws, in which he gave bishops judicial powers, seems to have been an attempt to equalize the civil justice system, which then (as now) was slanted against those who lacked money and influence. Today when ordinary people take the powerful to court, the powerful use high-priced lawyers to drag out legal proceedings in ways that tax the resources of ordinary people. Times never change. Constantine believed that bishops would make fairer judges. Naive? Yes. But it can only be considered a “power play” insofar as he sought power from on high. This is not to say that Constantine was fantastic or that Christian imperialism is the way to go. It is only to say that our assessments of the past tend to be colored by anachronistic presumptions about what people believed and did to secure their own power. Constantine was not a hero, but he was not a villain either. Thus our assessments of him and of so-called “Constantinianism” need to be more balanced. “Rome-Capitole-StatueConstantin” by Jean-Christophe Benoist, I. 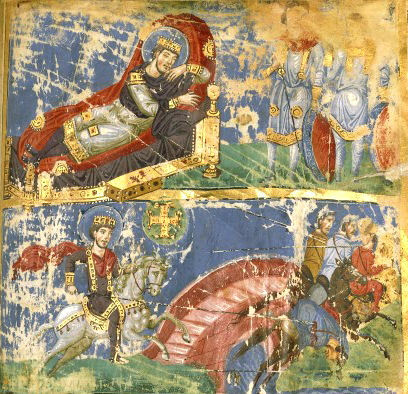 “Dream of Constantine Milvius” by Biblothèque nationale de France. “Hagia Sophia Southwestern Entrance” by Myrabella de Rivative .